(Click image to enlarge) Photographed over Neath, South Wales © Mike Davies. See this photo in the Cloud Gallery here. Should we appreciate contrails or not? That is the question vexing cloudspotters the world over. Contrails are those lines of cloud that you can see forming behind high-altitude aircraft. These man-made clouds only appear when the air up at cruising altitude is cold enough and moist enough to cause the water varpour in the engine’s exhaust to freeze into ice crystals and remain in the sky in the aircraft’s wake. So they are clouds – but ones that man has added to the natural cloudscapes. But are these man-made clouds worthy of appreciation by the Cloud Appreciation Society? They can serve as early indicators of a change in the weather, for when contrails persist and spread across an otherwise blue sky, they can be the first sign of the arrival of a weather front, which will eventually bring rain. Also they can be very beautiful. When the conditions are right for contrails to persist in the air, they overlap, bisect and spread in the high-speed winds at cruising altitude, adding a modernist counterpoint to the chaotic, impressionistic formations of the natural clouds. The water vapour element of aircraft exhaust may not be the most significant from the point of view of climate change (when compared with the other greenhouse gasses it contains), but it is the most visible expression of the effect that aviation is having on our atmosphere. 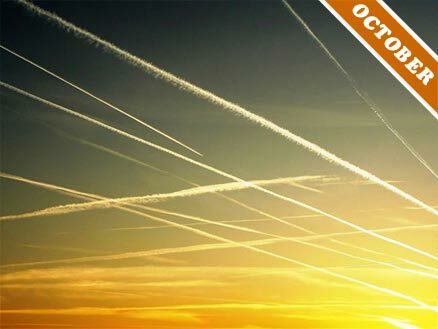 Contrails also encourage the formation of other high clouds, like Cirrus and Cirrostratus, which tend to trap in the Earth’s warmth, rather than reflect away the Sun’s heat like low clouds. This only affects ground temperatures while the clouds are in the sky, but the ever-increasing amount of air travel means the overall warming effects caused by contrails might well be significant. While I LOVE clouds and always have I absolutely hate CHEMtrails because they are loaded with barium and aluminum. CONtrails do not last for hours on end while Chemtrails do. Big difference between the two. Facilities exist all around the world to produce ELF waves and mess with the ionisphere. Not to mention the earth. Science has gotten very weird and dangerous. Unbelievable, photography at its best! this would make an excellent hd wallpaper.